IMG_6203, a photo by TinCanDaisy on Flickr. I couldn't help myself.....I kept seeing all these gorgeous Ooshka's being made in blogland and had to join in the fun! The fabric choices were not my own. I would have picked a bunch of florals and personally I think it's a bit of Ooshka overkill but hey, beauty is in the eye of the beholder (and in this case the receiver). Besides, I am not the style police lol. I did make a little alteration to the pattern and made this Ooshka a bit wider. I felt she needed to be a bit more cuddly and I'm happy with her width but next time I may make her longer too. I can't ever seem to make anything without altering it in some way. I've tried, but it's no good. I can't help myself. I had to add the lace that frames her face as the face panel was fraying something terrible and I could see it would come off eventually. I also had to add the flowers as someone took to dollies face with a biro.....but all is well as the flowers add a cute touch. Oh I think she is gorgeous I know my DD would love one. Can you please tell me where did you buy the face panel? And my Lulu would have chosen the same fabrics. LOL! 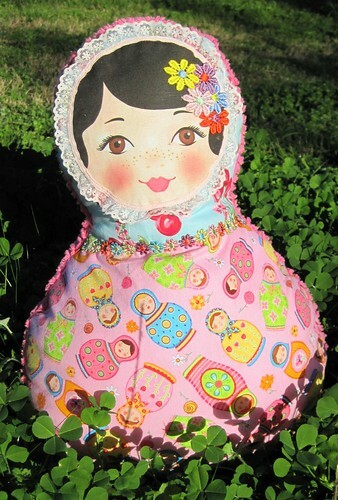 I made her using the Ooshka Babushka pattern kit by the Red Thread. They have a website theredthread.com.au so if you visit them you be able to find an online seller. I actually found quite a few online sellers just by googling Ooshka Babushka, but they are in Australia and I'm not sure where you prefer to get things shipped from. I found mine just by chance in my local fabric store.